The typical job duties of a Desktop Analyst include configuring, deploying, maintaining, troubleshooting and supporting workstations, systems, laptops, printers, Smartphone or any other electronic telecommunication types of equipment. The other job responsibilities of a desktop Analyst is to diagnose and resolve application software problems, maintain inventory, ensure seamless interconnection, configure system servers, document procedures and so on. The demand for analysts is constantly in demand as the job templates of a Desktop analyst fit well for applying to various other related roles like Computer operator, computer support technician, Data analyst and so on. Even though a four-year degree is not required for this job post, some of the employers look out for a Desktop Analyst Resume that has ample certifications such as TIA A+. Candidates with a Bachelors degree in Mathematics, Science, Computer Science or IT are eligible for this job post. Objective : 4 years of experience as a Desktop Analyst is seeking to acquire a challenging position in which my professional and educational expertise will be utilized to promote industry growth and gain knowledge and experience. 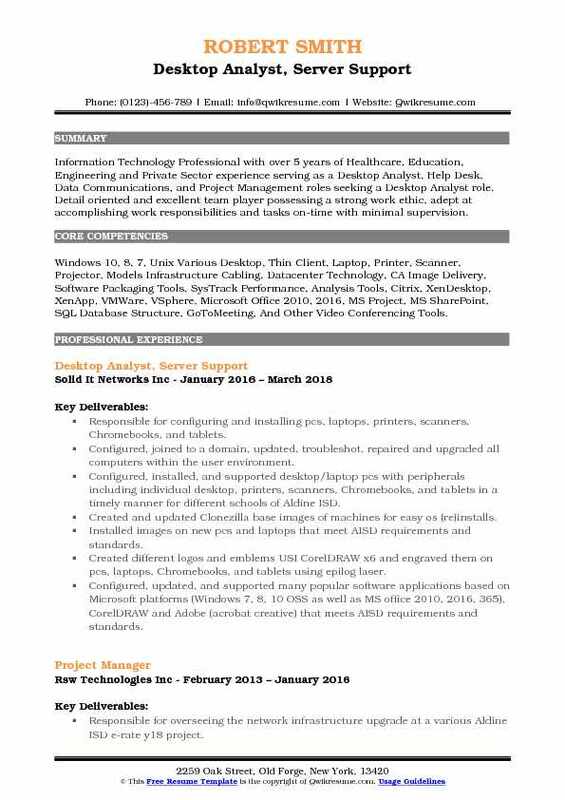 Skills : Microsoft Office, Network Management, Hardware, Software, Computer Repair, Computer Hardware, Assembly, Customer Service, Desktop Support, Management, And Manufacturing. Supported and migrated over 600 workstations from win XP - win7 enterprise. Deploying and created packages for software distribution to workstations/laptops via CA - ITCM server. Creating and maintaining images for different departments in government programs project. Providing technical support and recommendations to customers via phone, e-mail and remote desktop sharing, dame ware remote v10, ms office communicator 2007r2 a Microsoft Lync 2013. Managing Sophos safeguard encryption enterprise v6. 0 by encrypting government program laptops. Deploying and managing safe and endpoint security solutions, such as endpoint data protection and data leakage prevention solution - controlling every endpoint and every device, over every interface. Managing local and domain-wide user groups membership roles through active directory. Responsible for all desktops, laptop moves, adds and changes of ownership. Supporting and troubleshooting connectivity issues in a TCP/IP network environment. Enabling remote users to access government programs LAN network with VPN and wireless connectivity. Installing and troubleshoot mainframe 3270 applications software, upgrades service packs/patches. Monitoring and troubleshooting call center operation applications such as sonata avaya, calabrio, ngd, mdb, ms office 2007/2010/2013 suite, symantec e-mail vault, i.e., proxy settings, dns, LAN/WAN, VLANs devices, file print servers. 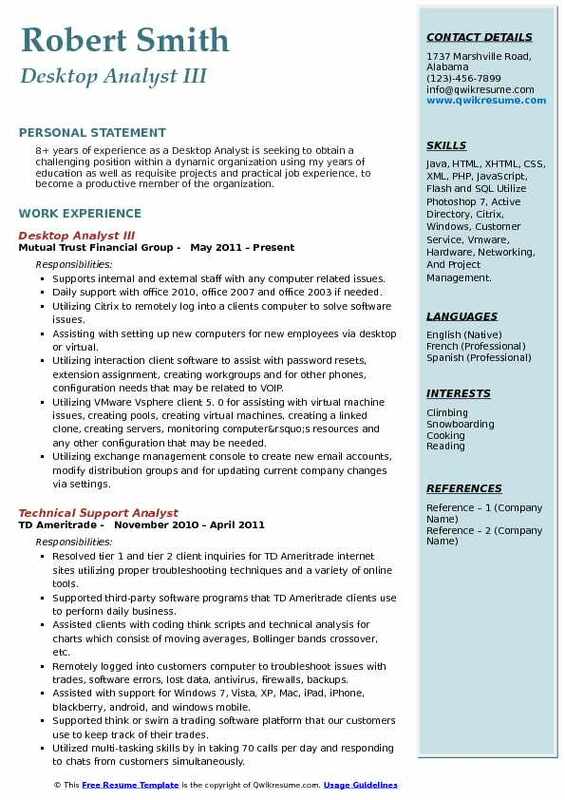 Summary : 22+ years experienced Computer Desktop Support Analyst and infrastructure technician, including 12 most recently in a major manufacturing Fortune 200 environment; excellent problem-solving, communication and interpersonal skills; self-motivated IT professional that can assimilate all responsibilities. 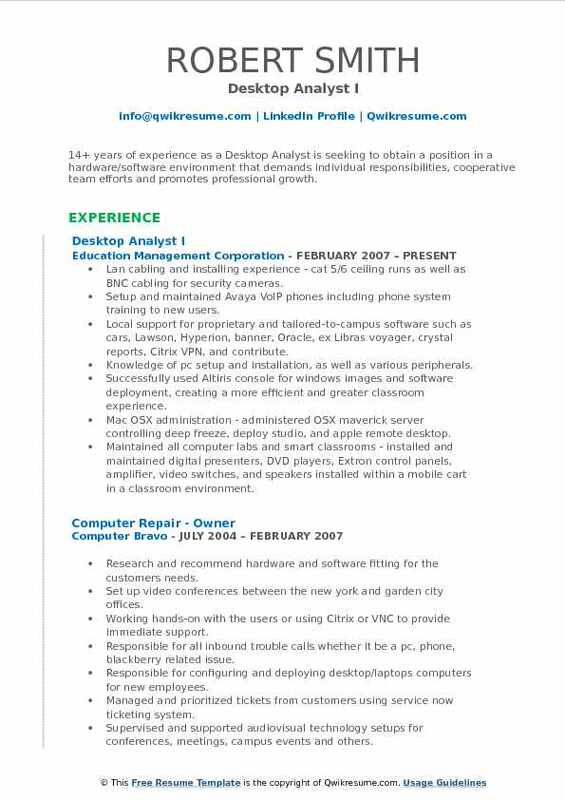 Skills : Software/Hardware Microsoft Windows XP/7/8 (Very Strong), Various UNIX And LINUX Flavors (low To Intermediate), MacOS (low To Intermediate), MS Office Suites Lotus Notes; Web Browsers, Various Full-edit CAD Applications, Environmental Monitoring (SAFER), Aspentech Manufacturing (IP21), Dell, HP, IBM Servers, Desktops, Laptops, And Workstations. Active directory - creating/deleting/maintaining user and machine domain accounts, creating security groups and subsequent ACL administration, file/folder permissions, password resets, etc. TCP/IP, DNS, and DHCP configurations; IP addressing, physical network issues and connectivity. Creating and maintaining PC images and managed computer replacement rollouts. Installing and supporting a various technical, cad and manufacturing software applications. Wrote updated technical documentation and procedural/instructional manuals. Investigating and resolving complex operating system and software conflicts and incompatibilities. Implementing and supporting special infrastructure projects as dictated by the environment. Creating and maintaining an extensive site hardware inventory and software licensing information. Knowledge of routers, switches and firewalls and other network devices. Managing and coordinating dell technicians when on calls them to a local site. Working with outside vendors on special projects and software/hardware problems. 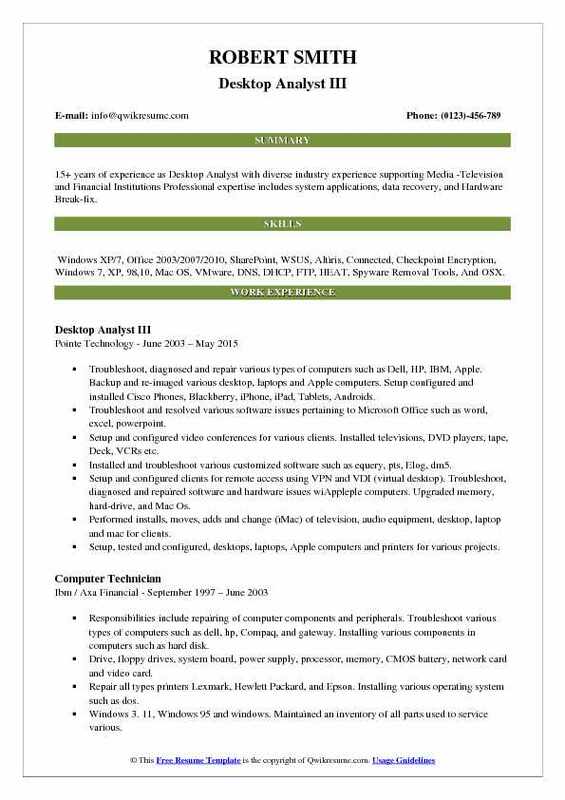 Summary : 15+ years of experience as Desktop Analyst with diverse industry experience supporting Media -Television and Financial Institutions Professional expertise includes system applications, data recovery, and Hardware Break-fix. 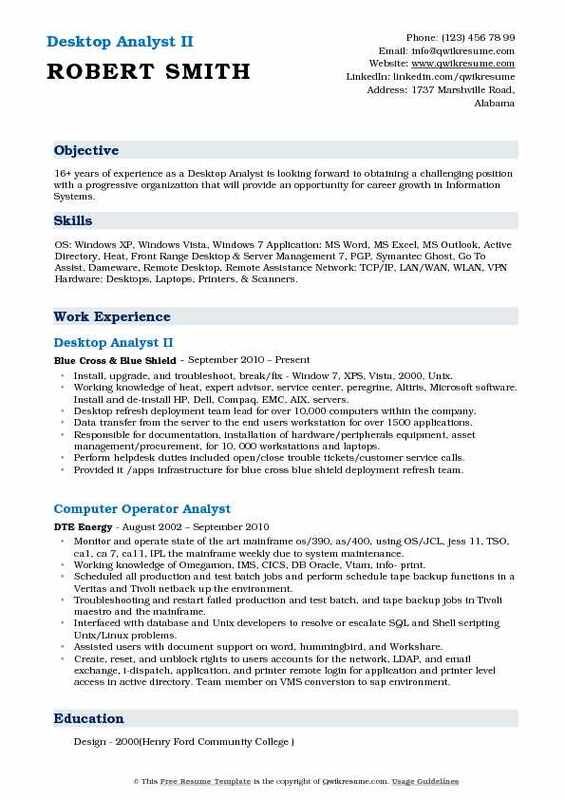 Skills : Windows XP/7, Office 2003/2007/2010, SharePoint, WSUS, Altiris, Connected, Checkpoint Encryption, Windows 7, XP, 98,10, Mac OS, VMware, DNS, DHCP, FTP, HEAT, Spyware Removal Tools, And OSX. Troubleshoot, diagnosed and repair various types of computers such as Dell, HP, IBM, Apple. Backup and re-imaged various desktop, laptops and Apple computers. Setup configured and installed Cisco Phones, Blackberry, iPhone, iPad, Tablets, Androids. Troubleshoot and resolved various software issues pertaining to Microsoft Office such as word, excel, powerpoint. Setup and configured video conferences for various clients. Installed televisions, DVD players, tape, Deck, VCRs etc. Installed and troubleshoot various customized software such as equery, pts, Elog, dm5. Setup and configured clients for remote access using VPN and VDI (virtual desktop). Troubleshoot, diagnosed and repaired software and hardware issues wiAppleple computers. Upgraded memory, hard-drive, and Mac Os. Performed installs, moves, adds and change (iMac) of television, audio equipment, desktop, laptop and mac for clients. Setup, tested and configured, desktops, laptops, Apple computers and printers for various projects. Coordinated hardware repair processes with outside vendors. Resolved technical issues for clients in person, on the phone, and through e-mail. Installed motherboards, processors, RAM and graphics cards. Performed desktop and laptop repairs for dell, hp, IBM, Lenovo. Repaired and reinstalled software such as Microsoft office, aim, chrome, firefox, Alias client. Diagnosed, installed, Configured and repaired computer systems and software. Supported customers having data connectivity. Removed e-added clients back to the various domain. Mapped user to various print servers. Summary : 14+ years of experience as a Desktop Analyst is seeking to obtain a position in a hardware/software environment that demands individual responsibilities, cooperative team efforts and promotes professional growth. 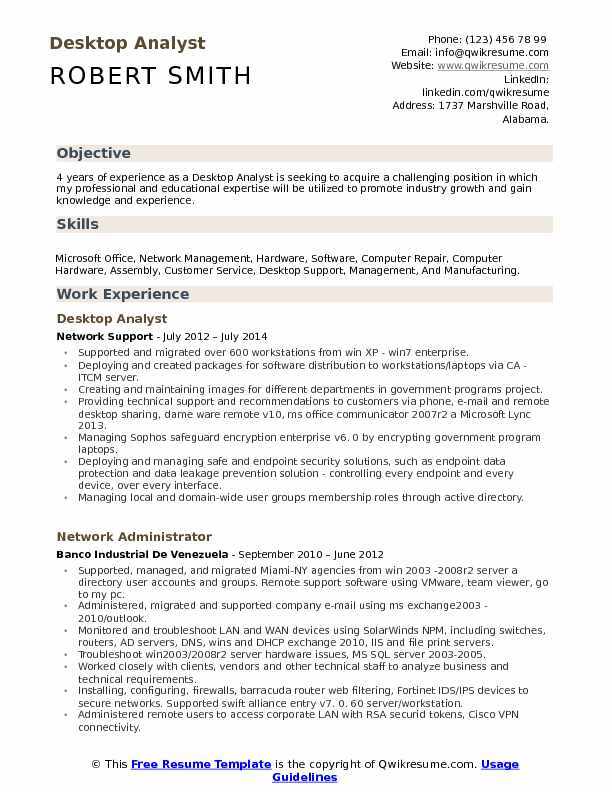 Skills : Active Directory, Backup Exec, Backups, Mobile Devices, Printers, Computer Competency With Microsoft Office Suite, Including Word, Excel, Access, FrontPage, Publisher And PowerPoint; Windows8, Windows 7. Lan cabling and installing experience - cat 5/6 ceiling runs as well as BNC cabling for security cameras. Setup and maintained Avaya VoIP phones including phone system training to new users. Local support for proprietary and tailored-to-campus software such as cars, Lawson, Hyperion, banner, Oracle, ex Libras voyager, crystal reports, Citrix VPN, and contribute. Knowledge of pc setup and installation, as well as various peripherals. Successfully used Altiris console for windows images and software deployment, creating a more efficient and greater classroom experience. Mac OSX administration - administered OSX maverick server controlling deep freeze, deploy studio, and apple remote desktop. Maintained all computer labs and smart classrooms - installed and maintained digital presenters, DVD players, Extron control panels, amplifier, video switches, and speakers installed within a mobile cart in a classroom environment. Prepare technology with enhancements necessary for new-quarter classes. Oversaw 4-8 person crew running technology-based equipment rentals and print shop services. Successfully implemented procedures to obtain higher efficiency and fewer errors within the rental equipment facility. 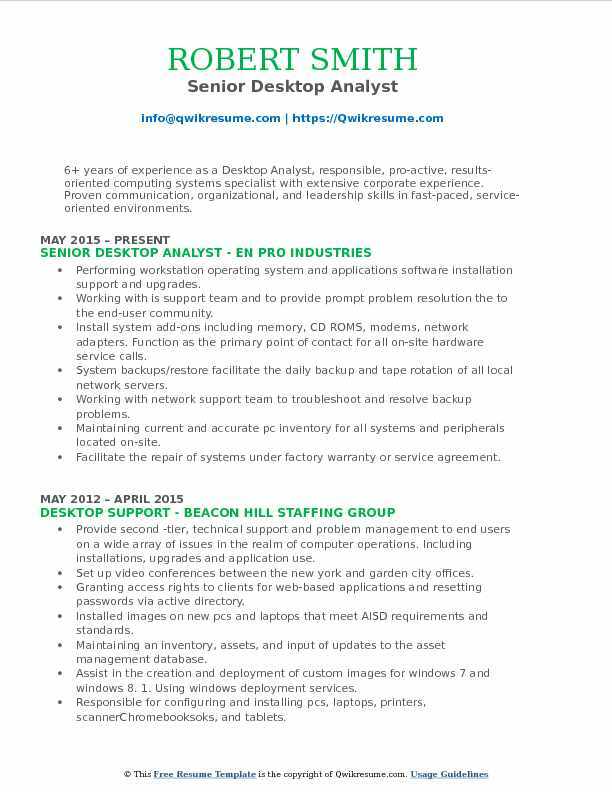 Summary : 8+ years of experience as a Desktop Analyst is seeking to obtain a challenging position within a dynamic organization using my years of education as well as requisite projects and practical job experience, to become a productive member of the organization. Supports internal and external staff with any computer related issues. Daily support with office 2010, office 2007 and office 2003 if needed. Utilizing Citrix to remotely log into a clients computer to solve software issues. Assisting with setting up new computers for new employees via desktop or virtual. Utilizing interaction client software to assist with password resets, extension assignment, creating workgroups and for other phones, configuration needs that may be related to VOIP. Utilizing VMware Vsphere client 5. 0 for assisting with virtual machine issues, creating pools, creating virtual machines, creating a linked clone, creating servers, monitoring computer’s resources and any other configuration that may be needed. Utilizing exchange management console to create new email accounts, modify distribution groups and for updating current company changes via settings. Utilizing Commvault to backup file servers and personal workstations, also utilize this software to help restore critical files that an employee may need. Configuring RSA tokens for employees for secure connection to our office from outside of our building. Giving them access to network drives and outlook access once connected. Creating virtual thin apps so we could update proprietary software and push them out to the assigned desktops to whom needs it. Also, contribute to the installation process and support of on-base file system and RightFax. Summary : 16+ years of experience as a Desktop Analyst is looking forward to obtaining a challenging position with a progressive organization that will provide an opportunity for career growth in Information Systems. Skills : OS: Windows XP, Windows Vista, Windows 7 Application: MS Word, MS Excel, MS Outlook, Active Directory, Heat, Front Range Desktop & Server Management 7, PGP, Symantec Ghost, Go To Assist, Dameware, Remote Desktop, Remote Assistance Network: TCP/IP, LAN/WAN, WLAN, VPN Hardware: Desktops, Laptops, Printers, & Scanners. Install, upgrade, and troubleshoot, break/fix - Window 7, XPS, Vista, 2000, Unix. Working knowledge of heat, expert advisor, service center, peregrine, Altiris, Microsoft software. Install and de-install HP, Dell, Compaq, EMC, AIX, servers. Desktop refresh deployment team lead for over 10,000 computers within the company. Data transfer from the server to the end users workstation for over 1500 applications. Responsible for documentation, installation of hardware/peripherals equipment, asset management/procurement, for 10, 000 workstations and laptops. Perform helpdesk duties: included open/close trouble tickets/customer service calls. Provided it /apps infrastructure for blue cross blue shield deployment refresh team. Create, reset, and unblock rights to users accounts for the network, LDAP, and email exchange, i-dispatch, provide a remote login for application and printer level access in active directory. Headline : 6+ years of experience as a Desktop Analyst, responsible, pro-active, results-oriented computing systems specialist with extensive corporate experience. Proven communication, organizational, and leadership skills in fast-paced, service-oriented environments. Skills : Research & Analysis, Client Relationship Management, Software Packages, Microsoft Office Suite, Communicator, Adobe Applications, Six Sigma Applications, Remote Administration Tools, And Oracle Applications. Performing workstation operating system and applications software installation support and upgrades. Working with is support team and to provide prompt problem resolution the to the end-user community. Install system add-ons including memory, CD ROMS, modems, network adapters. Function as the primary point of contact for all on-site hardware service calls. System backups/restore: facilitate the daily backup and tape rotation of all local network servers. Working with network support team to troubleshoot and resolve backup problems. Maintaining current and accurate pc inventory for all systems and peripherals located on-site. Facilitate the repair of systems under factory warranty or service agreement. Providing technical support for special projects as directed. Work with vendors and internal staff to deliver and implement new technologies and system upgrades. Maintaining local network/connection floor plans. Maintains a local library of support policies, procedures, and guidelines. Objective : Information Technology Professional with over 5 years of Healthcare, Education, Engineering and Private Sector experience serving as a Desktop Analyst, Help Desk, Data Communications, and Project Management roles seeking a Desktop Analyst role. Detail oriented and excellent team player possessing a strong work ethic, adept at accomplishing work responsibilities and tasks on-time with minimal supervision. Skills : Windows 10, 8, 7, Unix Various Desktop, Thin Client, Laptop, Printer, Scanner, Projector, Models Infrastructure Cabling, Datacenter Technology, CA Image Delivery, Software Packaging Tools, SysTrack Performance, Analysis Tools, Citrix, XenDesktop, XenApp, VMWare, VSphere, Microsoft Office 2010, 2016, MS Project, MS SharePoint, SQL Database Structure, GoToMeeting, And Other Video Conferencing Tools. Responsible for configuring and installing pcs, laptops, printers, scanners, Chromebooks, and tablets. Configured, joined to a domain, updated, troubleshot, repaired and upgraded all computers within the user environment. Configured, installed, and supported desktop/laptop pcs with peripherals including individual desktop, printers, scanners, Chromebooks, and tablets in a timely manner for different schools of Aldine ISD. Created and updated Clonezilla base images of machines for easy os (re)installs. Installed images on new pcs and laptops that meet AISD requirements and standards. Created different logos and emblems USI CorelDRAW x6 and engraved them on pcs, laptops, Chromebooks, and tablets using epilog laser. Configured, updated, and supported many popular software applications based on Microsoft platforms (Windows 7, 8, 10 OSS as well as MS office 2010, 2016, 365), CorelDRAW and Adobe (acrobat creative) that meets AISD requirements and standards. Installed x460-g2 stack switch, s4 and s8 chassis, 1500va, 6kva and 10kva ups in network closets at Aldine ISD schools. Conducted computer diagnostics to investigate and resolve problems and to provide technical assistance and support. 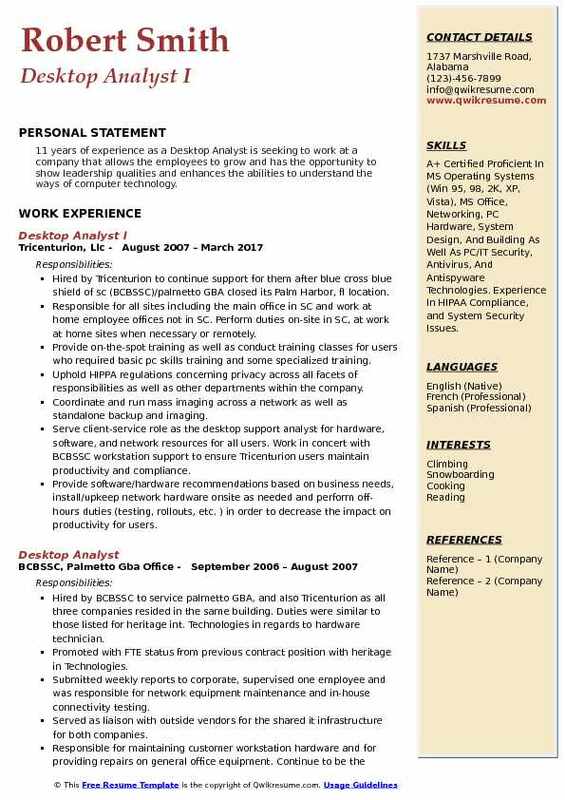 Summary : 11 years of experience as a Desktop Analyst is seeking to work at a company that allows the employees to grow and has the opportunity to show leadership qualities and enhances the abilities to understand the ways of computer technology. Skills : A+ Certified Proficient In MS Operating Systems (Win 95, 98, 2K, XP, Vista), MS Office, Networking, PC Hardware, System Design, And Building As Well As PC/IT Security, Antivirus, And Antispyware Technologies. Experience In HIPAA Compliance, and System Security Issues. Hired by Tricenturion to continue support for them after blue cross blue shield of sc (BCBSSC)/palmetto GBA closed its Palm Harbor, fI location. Responsible for all sites including the main office in SC and work at home employee offices not in SC. Perform duties on-site in SC, at work at home sites when necessary or remotely. Provide on-the-spot training as well as conduct training classes for users who required basic pc skills training and some specialized training. Uphold HIPPA regulations concerning privacy across all facets of responsibilities as well as other departments within the company. Coordinate and run mass imaging across a network as well as standalone backup and imaging. 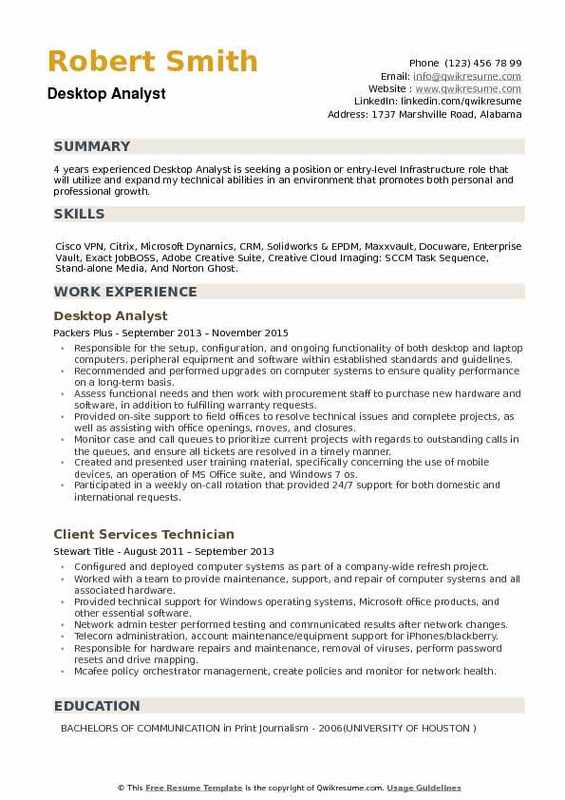 Serve client-service role as the desktop support analyst for hardware, software, and network resources for all users. Work in concert with BCBSSC workstation support to ensure Tricenturion users maintain productivity and compliance. Provide software/hardware recommendations based on business needs, install/upkeep network hardware onsite as needed and perform off-hours duties (testing, rollouts, etc. ) in order to decrease the impact on productivity for users. Perform particular duties of the security officer in relation to CMS anMedicarere security and compliance. Perform duties for Tricenturion to update and complete federal information security management act (FISMA) requirements to fulfill its GSS requirements. Objective : 4 years experienced Desktop Analyst is seeking a position or entry-level Infrastructure role that will utilize and expand my technical abilities in an environment that promotes both personal and professional growth. 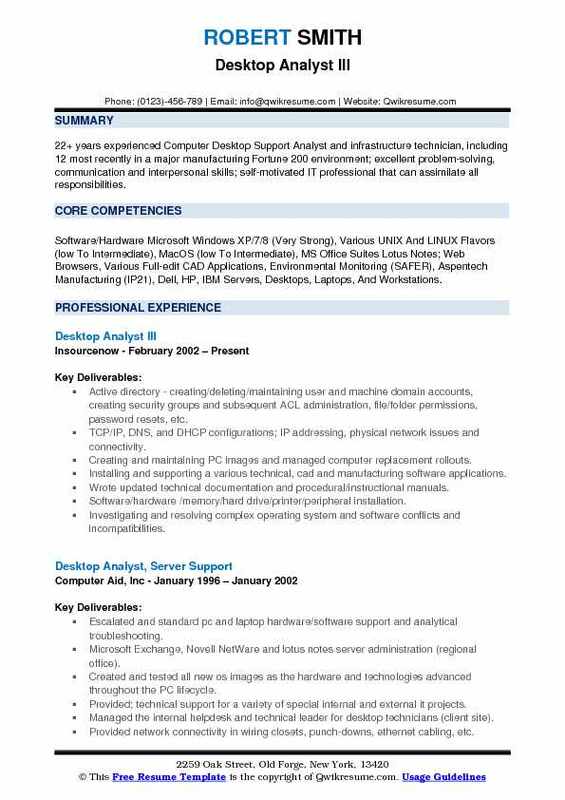 Skills : Cisco VPN, Citrix, Microsoft Dynamics, CRM, Solidworks & EPDM, Maxxvault, Docuware, Enterprise Vault, Exact JobBOSS, Adobe Creative Suite, Creative Cloud Imaging: SCCM Task Sequence, Stand-alone Media, And Norton Ghost. Responsible for the setup, configuration, and ongoing functionality of both desktop and laptop computers, peripheral equipment and software within established standards and guidelines. Recommended and performed upgrades on computer systems to ensure quality performance on a long-term basis. Assess functional needs and then work with procurement staff to purchase new hardware and software, in addition to fulfilling warranty requests. Provided on-site support to field offices to resolve technical issues and complete projects, as well as assisting with office openings, moves, and closures. Monitor case and call queues to prioritize current projects with regards to outstanding calls in the queues, and ensure all tickets are resolved in a timely manner. Created and presented user training material, specifically concerning the use of mobile devices, an operation of MS Office suite, and Windows 7 os. Participated in a weekly on-call rotation that provided 24/7 support for both domestic and international requests. Assisted with asset management and hardware documentation via Sharepoint.